DAVOS (Reuters) - The execution of Mexican citizen Edgar Tamayo by lethal injection in Texas sets a bad precedent for upholding international law, Mexico's President Enrique Pena Nieto said on Thursday. The Mexican government had called on Texas to halt Wednesday's execution, calling it a violation of international law, and U.S. Secretary of State John Kerry had asked Texas Governor Rick Perry to consider a stay. "The failure to respect the decision of this process as mandated by the international court in the Hague unfortunately creates a bad precedent," Pena Nieto told Reuters as he left an event at the World Economic Forum in Davos, Switzerland. 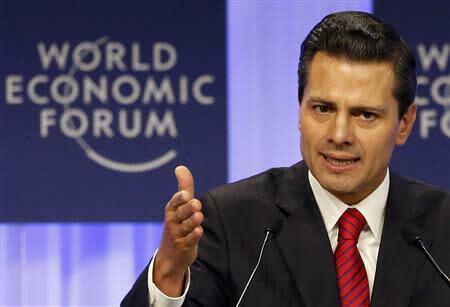 Pena Nieto was referring to a 2004 ruling by the United Nations' International Court of Justice which said that the United States had failed to make 51 Mexican citizens facing the death penalty, including Tamayo, aware of their right to consular assistance at the time of their arrests. Tamayo, convicted of fatally shooting a Houston police officer in 1994, was denied a last minute stay of execution by the U.S. Supreme Court. The 46-year-old was pronounced dead at a state prison in Huntsville, Texas, late on Wednesday. Texas argued that it is not bound by the International Court of Justice ruling. The State Department said in a statement on Thursday it "regrets Texas' decision to proceed with Mr. Tamayo's execution without that review and reconsideration, but remains committed to working to uphold our international obligations. "This case illustrates the critical importance of Congress passing the Consular Notification Compliance Act, which would provide an additional mechanism for the United States to meet our international obligations." Tamayo's family members maintained his innocence and had hoped for an 11th-hour reprieve, gathering at the home of Tamayo's parents in Miacatlan in central Mexico on Wednesday. "His family, his friends, we are in so much pain," said Edelmira Arias, Tamayo's cousin.